Thoroughbred racing’s Triple Crown is said to be one of the most elusive feats to capture in all of sports. Three races, in three states, in just five weeks; only the toughest three-year-olds set out in pursuit of it. It starts with the 1 ¼ mile test in the Kentucky Derby at Churchill Downs in the heart of Louisville, is followed two weeks later with the 1 3/16 mile Preakness Stakes at Pimlico Race Course just outside of Baltimore, Maryland, and ends with 1 ½ mile Belmont Stakes at Belmont Park on the outskirts of New York City. Below are 13 fast facts about past Triple Crown bids and winners. #3. 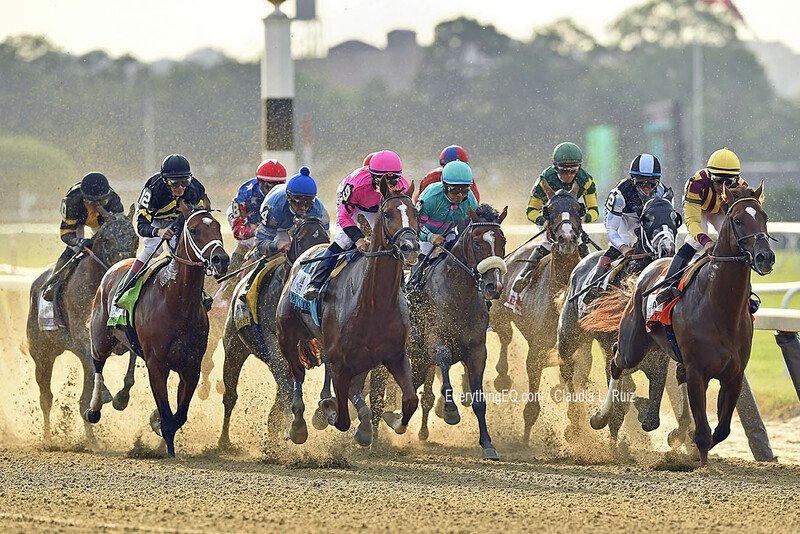 Of the 20 horses who made it to the starting gate while trying to take home the Triple Crown in the Belmont Stakes, 9 of them lost to a horse that did not race in the Kentucky Derby or Preakness. Those 9 are marked by an asterisk (*) in the list above. #4. Contrary to popular belief, the Belmont Stakes does not favor any particular running style. Since 1898, 66 horses have won the Belmont Stakes while running on or near the lead while 51 horses have won by coming from off the pace. #5. Favorites have not fared well in the Belmont Stakes. Since pari-mutuel wagering was introduced in 1940, only 22 horses have won the Belmont Stakes while going off as the post time favorite, while 56 have won at a larger price. #6. In 1920 Man O’ War won the Preakness by 1 ½ lengths and crushed the Belmont Stakes by 20 lengths. Man O’ War, however, did not run in the Kentucky Derby. Sam Riddle, Man O’ War’s owner, elected not to run in the Kentucky Derby due to his thought that a horse should not run a 10-furlong race so early in their career. #7. Gallant Fox is the only Triple Crown Winner to have sired a Triple Crown winner. He sired Omaha and Affirmed. #8. Gallant Fox and Assault are the only two horses to enter the Belmont Stakes as Triple Crown bids who did not go off as the post time favorite. Both horses won the Belmont Stakes and became Triple Crown Winners. #9. Eddie Acaro is the only jockey to win the Triple Crown twice. #10. Post position #1 has produced the most amount of winners in Belmont Stakes history; 23. #11. Victor Espinoza is the oldest jockey (43 years old) to win the Triple Crown. Justify’s jockey, Mike Smith, is 52 years old. #12. James E. Fitzsimmons is the only trainer in history to saddle two Triple Crown Winners (Gallant Fox and Omaha). Bob Baffert, who trained 2015 Triple Crown winner American Pharoah, is the trainer of this year’s Triple Crown hopeful Justify. #13. In 2015, there were 94,237 $2 win tickets purchased on American Pharoah. 90,128 of those tickets remained uncashed by the next Monday. Many of them are thought to have become souvenirs for race fans across the country.